Famed for the Woodstock Music Festival (which took place in another New York county 50 miles southwest), the town of Woodstock, New York is a laid-back, bucolic, bohemian place that seems frozen in time. 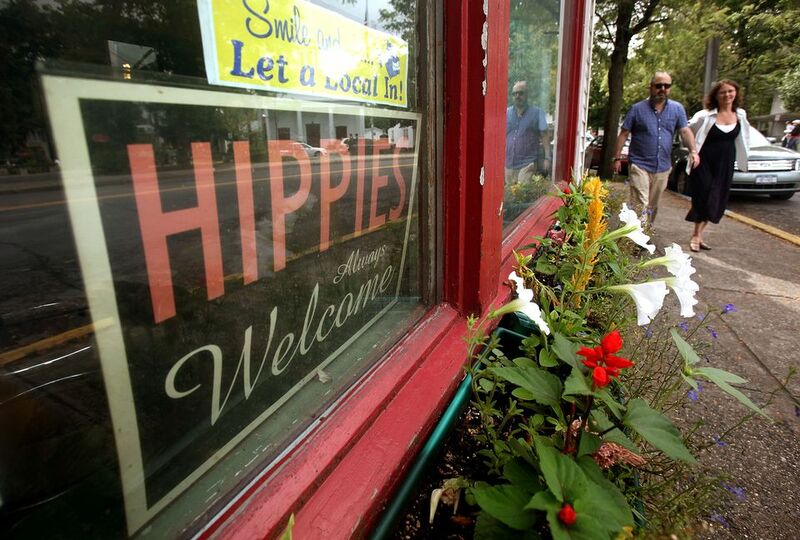 In Woodstock, you still can see (aging) hippies, a store that only sells candles, and another that traffics in 40-year-old pictures of one-time resident Bob Dylan. No one blinks if you wear tie-dye—there's also a shop for that—but you would get an odd glance if you strolled around in a suit and tie. A love of the arts (particularly folk and rock music), a fascination with Eastern religions, support for feminism and left-wing politics, a spirit of tolerance, and an appreciation of the outdoors also characterize Woodstock. These pictures focus on Woodstock attractions and include the colorful, fanciful shops and eateries that make it such a unique place to visit. The maturely dissected plateaus of the Catskills (they're not technically mountains) around Woodstock feature many lush valleys fed by creeks and streams. Channel the 1960s with tie-dye T-shirts, Woodstock Festival posters, guitars, bumper stickers, pins, and other Woodstock souvenirs. The Woodstock Playhouse is a seasonal community theater. The Bearsville Theater is Woodstock, NY's top venue for live concerts. It is surrounded by some of the area's best restaurants. Find out more about Woodstock's Bearsville Theater. The Wild Rose Inn is a pretty little bed-and-breakfast located in Woodstock, NY and a short walk from Tinker Street in the center of town. Find out more about The Wild Rose Inn. Tannery Brook runs through Woodstock, a reminder of the region's history as a leather-tanning hub. Every weekend locals and tourists congregate at the Woodstock Flea Market. A visit to the Woodstock Flea Market can be entertaining. Woodstock's Candlestock store exclusively sells candles and candle holders, some of which are impressive examples of candle makers' and sculptors' art. Find out more about Candlestock. Another Woodstock institution, Loominus is a local workshop that creates buttery soft chenille scarves and clothing in exquisite color combinations. Find out more about Loominus. Pegasus Footwear is another Woodstock NY institution. It specializes in shoes that are as stylish as they are comfortable. Find out more about Pegasus Footwear online. It's not a big store, or a fancy one. But Pegasus Shoes shods Woodstock residents. Some might say there are many pleasures of Woodstock, including the sylvan setting and the laidback town. There is also a store with that name. No self-respecting bohemian can decorate his crib without a rug from an exotic destination. Anatolia Tribal Rugs Weavings get underfoot in Woodstock, NY. Sidewalk vendor attempts to drum up business. A nursery and a grocery, Gallo's of Woodstock is located on the outskirts of town on Route 212. Open-air Landau Grill has served burgers to generations of Woodstockers. The vast Ashokan Reservoir near Woodstock, NY is one of several that provide fresh, clean, delicious-tasting water to the residents of New York City. Find out more about the Ashokan Reservoir. What Are the Most Romantic Restaurants on Long Island?